Once I got back from California, I had a day to pack at home and then it was off to Florida with the family. 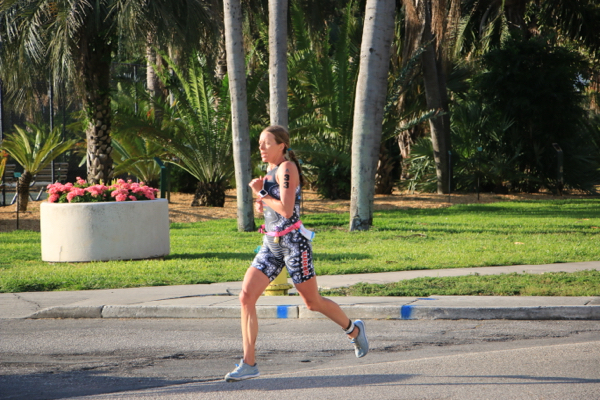 I decided that I wanted to travel to Florida early so that I had time to do pre-race training in Florida and have a little down time before the race. My family and I stayed in Clermont, which basically feels like home for us since we used to live there. We arrived on Tuesday night and drove into St. Petersburg on Friday for the race. While in Clermont, we enjoyed swimming at the NTC, playing at the parks and hanging out with friends. 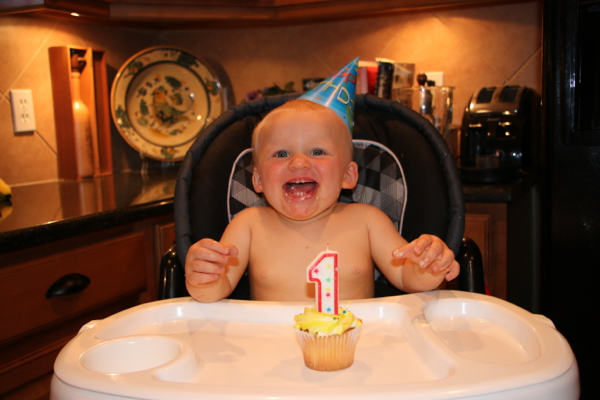 We also celebrated Connor’s first birthday! 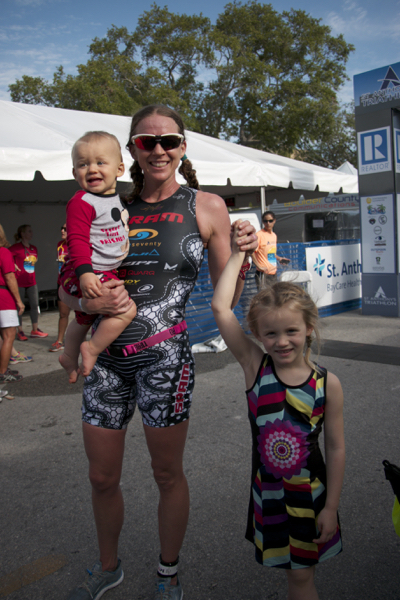 St. Anthony’s is one of my favorite races of all time. I love the city, the race atmosphere and the ease of racing. Once I park at the hotel, I don’t have to get back into the car. We went to a tasty British restaurant the first night we were in town. The restaurant had a great kids menu, which is a priority for us now! We loved walking through the parks and Caroline had a blast climbing the Banyan Trees! Connor also slept much better this trip, so this made me feel so much better heading into this race. 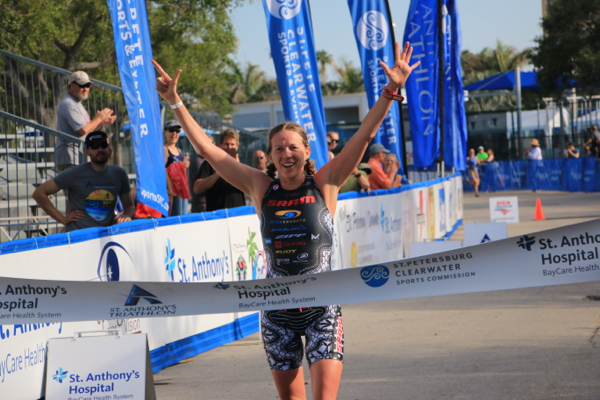 I really was hungry to win this race because I was going for my seventh win and breaking the previous record set by the legendary Michellie Jones. I didn’t want to visualize the end result, but instead wanted to think about what I was going to do to achieve the win. Race morning the weather was perfect as it was not too hot, had calm winds and an absolutely gorgeous backdrop! 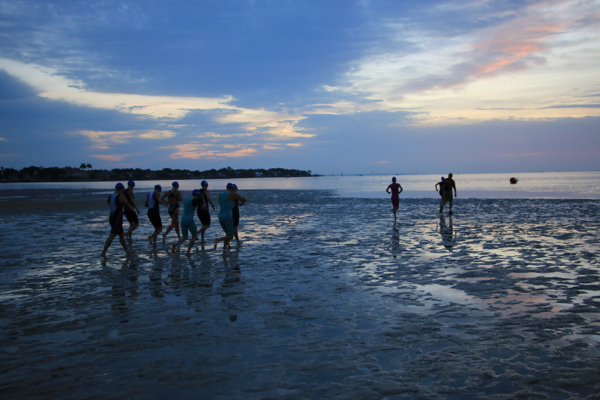 The swim started in the water and when the gun went off, I took the start very calm. It was one of the calmest swim starts I have ever experienced. 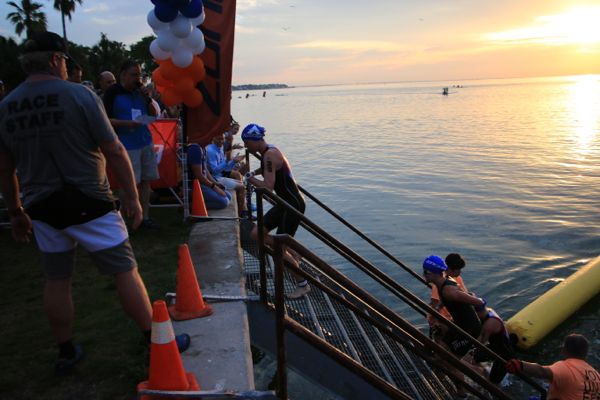 About 200 meters into the swim, I had the lead and tried to keep the pace fairly smooth. With the water being like glass, I knew that it would take a very hard effort to get separated from the strong swimmers in the race. I used my Blueseventy PZ4TX swim skin with the Blueseventy Element Goggels. Once I exited the bike, it was a bumpy sand run with the bike to the transition rack. 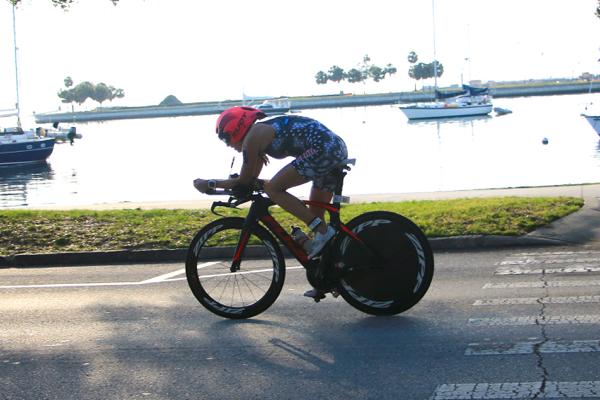 I had tunnel vision to get back up to the front and push the pace as soon as possible. A minute or so into the run, I got a side stitch and did the best I could to keep pushing and work through it. I also began to feel a little dizzy and nauseated, but knew I had to just keep pushing. This run felt like my bike last weekend, it did not come easy and I had to push the entire time, but I did it! I accomplished my goal and earned win #7. I told Nate before the race I was going to give it everything it took to accomplish this goal and happy to have earned it. My running gear used was: Altra Escalante-Racer, Mission HydroActice Multi-Cool, Rudy Project Tralyx SX, Triflare Blue Poppy custom Sarah Haskins line, T1 Pro Race belt, and I was able to race in my Groove Life ring all day and not have to worry about my diamond wedding band. There were so many days earlier this year that I struggled with mental and physical battles of training and life business and I wondered how I was going to give myself a chance to be at adequate fitness to toe the line to race. I just focused on one day at a time and continued to slowly chip away at gaining fitness. I am enjoying a few down days in Florida before heading back home. I am really excited to do some race specific training for Escape from Alcatraz, my next race on June 3rd. Thank you to all my family, friends and sponsors who give me continued support. A special thanks to my husband and my parents who help me every day.